Everything here is considered out-of-character, so please refrain from using this in RP! This is a work in progress! Peak human Strength and Durability, High Resistances, Disease Immunity, Lesser Healing Factor, Supernatural Senses, Angelic Magic, Flight. Aelith has pure white hair and a fair complexion, her skin a healthy tan. Her eyes are bright blue, often illuminated. She's often got a pair of white, feathery wings on her back, though she is able to hide them through use of minor angelic magic. Her build is very fit and muscular, though she's not very tall. She's a rather cliche' example of an angel, as her physical traits are granted to her by her angelic perfection. Generally speaking, however, Aelith hides her wings to fit in with humanity as best she can. Most of the time, Aelith is a soft spoken, kind, naive woman. She's not terribly smart, nor does she know much about human culture. She knows most common human languages, as well as some others, such as Latin. Her primary language is Enochian, and will sometimes slip into it during times of stress. While she is generally very considerate and polite, she is prone to small fits of emotion, such as anger or jealousy. This is due to her lack of familiarity with these emotions, having just recently obtained free will and emotion. She is prone to fits of rage if someone calls her a fallen, though her situation has given her a different view of things, and has caused her to be much more accepting. 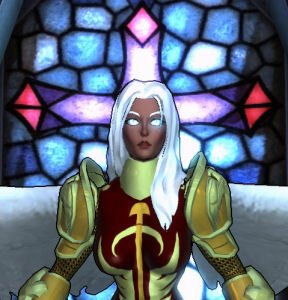 However...While she is wearing her armor, Absolution, her personality is drastically different. She becomes a militant angel, a zealous warrior of justice and vengeance. She's confrontational, unforgiving, stubborn, cold, and vengeful...completely opposite of her regular personality. This is not to say she is uncontrollable and raging, she is generally more than willing to follow orders...if she has any sort of respect for the person giving the orders. Aelith frequently spends her time at her local church, helping whenever she can with whatever she can. She teaches Sunday-school classes, sings in the choir, and will always volunteer for any kind of charity events, including work at the local animal shelter. There's not much else that she does that can really be considered a hobby. Aelith likes far too many things to list, so here is just a few. "Good" people- Generally, if someone is kind to Aelith, she'll like them, unless they carry excessive sins. Animals- She likes all animals, and usually they react rather calmly to her. Food- Having just recently developed the need for food, she's quickly taken a liking to it and is not very picky. Soft things- If it's plushy, fuzzy, or generally soft, she'll try to hug it. She uses her wings almost like a blanket when she sleeps. Music- She loves music above all else, and can often be caught singing while doing almost anything. Aelith isn't one to dislike much, so the list is short. "Bad" people- If someone is mean, unpleasant, or tainted by too many sins, chances are Aelith won't like them. Combat- She absolutely despises combat, and will avoid it if possible. Infernals/Demons- She's got a built-in racist tendency towards demonic types, though this can be overridden -sometimes- if the infernal is kind. Nephilim- Aelith is not particularly fond of Nephilim, also known as half-angels. She sees them as a mockery of her kind. Aelith was born, well...not born in the way humans are born, but she started life as a small, chubby little angel with big bright eyes, small little fluffy wings, and an unfathomable love for her God. She was trained vigorously as she grew, learning combat and magics, armor and weaponsmithing...anything her mentor was willing to teach, she eagerly accepted and committed to memory. She was not alone, nor was she the best of the group the particular Archangel, Zalael, was instructing, but she had a certain quality that made her stand out of the crowd. Whether or not that quality was particularly good is...up for debate. She was not the smartest of her peers, and she was far too timid and kind for the warrior caste she was born into. This posed quite the problem with her combat training, and it was soon obvious that she would have to be either destroyed or re-purposed. However, the Archangel Zalael did neither of these, being far too kind to do such a cruel thing. Instead, while forging the armor for the rest of her peers, he forged for her a special suit of mood-altering armor for her to wear in combat...a suit of angelic armor that he would name Absolution. Soon after Zalael finished training the group, the angel Lucifer rebelled, causing a large civil war within heaven, which was ended with Lucifer and his followers having been cast out of the divine city and into the fiery pit. The war was not without it's casualties, the Archangel Zalael having been slain in combat, betrayed by a group of the best of his students. In a fit of desperation, Aelith picked up Zalael's blade and engaged the group of her peers, fighting against those she had trained her entire life with. The battle was close, and Aelith herself suffered numerous injuries, but thanks to her specialized suit of armor, Absolution, and her mentor's enchanted blade, she emerged victorious. Heaven Wept, Sword of the Seventh Echelon, His Wrath and Temper, Cleaver of the Nine Hells, Blade of the Archangel Zalael. Aelith's arrival on Earth was not something that was planned, nor was it an easy journey. Due to a botched summoning spell, Aelith landed miles away from the summoning ritual, disoriented and weakened. Due to her confused state, she engaged in combat with heroes who had gathered to investigate the damage caused from her impact. In her weakened state, she was unable to put up much of a fight and was eventually apprehended. She was questioned, but upon learning that she had no memory of the events leading up to her arrival on Earth, she was released to the custody of the chinese hero Astraea Ling, at least, until more information could be obtained regarding the incident. Due to investigations led by Astraea and the half-demon hero Impsblood as Aelith's memories returned, some key information was learned. It was determined that Aelith was sent to eliminate Stacy Delacroix, the daughter of a sorceress named Veronica Delacroix. Powerful demonic enchantments had been placed on the half-demon child, enchantments powerful enough to draw the ever-watchful eye of the heavens. An Elysian Throne was sent to Earth with two objectives, to exile Aelith for failing to perform her duty, and to eliminate the half-breed child. The full name of this divine artifact is "Heaven Wept, Sword of the Seventh Echelon, His Wrath and Temper, Cleaver of the Nine Hells." Heaven Wept is a semi-sentient longsword, and if you are not chosen by it, it is very heavy and possibly even deadly to wield. It is made out of Pure Luminite, an incredibly heavy, rare, indestructible Elysian metal, and is heavily enchanted...It's rumored that the sword is infused with the essence of the slain Archangel, Zalael. The weapon itself has the following traits and abilities. The weapon is indestructible and never needs sharpening, though it is very heavy. It is always sheathed in a layer of holy fire. It can be recalled to the wielder's hand, and is very hard to disarm. It can be used as a focal point for spells, enhancing their effects. With the correct prayer, it can deal nonlethal damage. If it is held by someone evil, or someone who's soul bears numerous sins, it will ignite the wielder in holy fire until the wielder is cleansed of sins or dead, whichever comes first. The full name of this divine artifact is "Absolution, Aegis of the Divine Judgement, Might of the Holy Fire." Absolution is an enchanted suit of Luminite Alloy plate armor that increases the wielder's strength and durability exponentially. The armor is not without it's drawbacks, as only the individual the armor was made for can don it, and it drastically alters the wielder's personality. Absolution makes the wearer aggressive, unforgiving, and they will not accept defeat nor retreat. Due to the fact that it is not made of Pure Luminite, Absolution is not indestructible like Heaven Wept, but it is able to slowly repair itself. The suit of armor is also incredibly heavy. The Armor itself has the following traits and abilities. It's incredibly resistant to damage and can repair itself over time. It enhances the wielder's strength and durability, and also numbs the wielder to pain. It can sustain the wielder in uninhabitable environments, such as under water or in space. It enhances the wielder's combat prowess and morale. Absolution drastically alters the personality of the wielder to better suit combat situations, making them aggressive, unforgiving, and emotionless. Aelith is able to cast basic divine magic, including but not limited to healing spells, exorcisms, holy fire attacks, and various lesser spells. She is not nearly as adept as an Elysian spellcaster, and therefore cannot cast the more powerful divine spells. Most of her spells require some time to pray to activate, and cannot be used in the heat of battle. Healing prayers- She can mend non-fatal wounds including mending and reforming bone, reattaching limbs, and through great effort, regrowing a limb. Exorcisms- She is able to perform exorcisms, though not against very powerful spirits. Holy Fire- Aelith's sword is always coated in holy fire, which burns both body and soul of whomever it touches, the severity directly related to the amount of evil or sins the victim has done. She's also able to conjure a powerful lance formed of holy fire to use in combat, though it's size is too large to use in melee combat, and is generally reserved for long ranged assault. Minor incantations- This would include things such as scrying and minor purification spells, lesser disease curing, blessings, etc. One of her simplest yet most used incantations is her divine aegis, a spell that conjures a transluscent kite shield formed of holy fire. Resurrection- She is incapable of returning life to the dead. Expert level healing prayers- While she is capable of healing a great deal of damage, she cannot do so to the extent of one specialized in healing magic, and will tire fairly easily when she's healing, especially others. Due to her "Angelic Perfection", Aelith has a few inherent abilities. Peak human resilience, moderate pain threshold. Peak human strength, though not on par with Absolution. Incredible resistance to toxins, mind-affecting abilities, immunity to disease. Enhanced healing, though not on par with Healing Factor metahumans. Supernatural senses, mainly night vision and what can be called "soul-vision", which she uses to gauge the sins of a mortal. Banishment spells- While she cannot be banished back to Elysium, these spells are intensely painful and can render her unconscious, regardless of the suit she is wearing. Wing damage- None of her armor protects her wings, and therefore they are an easy way to render her grounded and badly wounded. While she can regrow them with a mix of time and healing magic, this is a crippling blow. Lightweight- She is very strong and resilient, but her light weight leaves her vulnerable to being thrown. This problem persists in Absolution, regardless of it's weight...she's just too light to keep from getting knocked around. Reliance on equipment- Her offensive and defensive capabilities rely on her weapon and armor suits. While she is a formidable fighter, she is not much of a match for most without her equipment and will lose all special abilities they grant if she loses them. Infernal Magics- She is highly resilient to most damage, but infernal magic, being her polar opposite, can cause her a great deal of harm. Attacks dealt by infernal spells or items can bypass a moderate amount of her armor's protection. She can still withstand a good deal of damage this way before dropping, however. Enchanted Weaponry- Her armor and body are incredibly resilient, but weapons enchanted specifically to dispatch mystical and extra-dimensional enemies have a much more potent effect on her than regular weapons. An example would be when she was training with Astraea Ling while wearing Absolution, Astraea's enchanted blades were able to slice through Absolution's thick plating. Luminite is a heavy Elysian metal that is used primarily in weapons and armor due to it's resilience, ability to permanently store magics, and immunity to rusting. It requires enchanted tools and a great deal of training to work with it, but the finished product is almost always of great quality. Luminite items must be enchanted during the smithing process, requiring multiple smithies for a single item, but when complete it is impossible to disenchant the item. It comes in two variants, Pure Luminite and Luminite Alloy. Pure Luminite- The most difficult form of Luminite to work with, though it is also the strongest. Any item made of Pure Luminite is indestructible, though it is often very heavy. Items made of Pure Luminite require a great deal of physical strength to wield. Luminite Alloy- Being the easiest form of Luminite to work with, Luminite Alloy is the metal chosen to make most equipment. Unlike it's pure counterpart, it is not indestructible, but it does have the ability to self repair based on the amount of Luminite in the item. Depending on what metal is mixed with it to form Luminite Alloy, it can either strengthen or weaken it, but it usually heavier than the additional alloyed metal(s). Most Luminite Alloy items are roughly a quarter of the weight of Pure Luminite items. This page was last modified on 14 December 2014, at 23:13.